What is Lincoln? Sorry, I mean the Lincoln Motor Company? There are concierges. Date nights. And this, the Lincoln MKZ. Is it a real luxury car, or is it a Fusion in a magician's outfit? If Cadillac is GM's BMW, then Lincoln wants to be Ford's Lexus. Caddy's focus for the last decade or so has been becoming one of the world class sports sedan makers. Lincolns are rebadged Fords, a page from the Toyota playbook that has paid them dividends over the years. The difference is that Cadillac's focus on becoming a legit sports sedan maker has worked. Lincoln's, I mean the Lincoln Motor Company's, focus has been, well, it hasn't really existed. And that means it hasn't really worked. There have been about a dozen identities in the last decade, none of them have resonated with the public, and Lincoln has floundered. Sales have decreased and the once proud leader of American luxury is now Ford's Miley Cyrus. But Lincoln, I mean the Lincoln Motor Company, is working on changing its perception amongst the public. It changed its name to the aforementioned Lincoln Motor Company. It now has an online concierge to help with buying decisions, something that I totally have no understanding of. There's a date night where you get to drive an MKZ to a nice dinner on Lincoln's dime. And then there's the MKZ. It's a car with the option of a simply gigantic panoramic roof. A car that Lincoln shows with well-dressed architect types with thin glasses and trendy haircuts and looks of inquisitiveness on their faces. A car for independent people that want to go their own way. A car that apparently appeals to the sorts of people that were supposed to be buying Saabs but weren't actually buying Saabs because Saab isn't really that much of a thing anymore. It seems to me that the sort of people Lincoln wants to buy their cars aren't the type of people that buy cars. That's an issue. They look like urban dwelling, independent minded people who'd rather walk down to the corner cafe for a peach-wheatgrass scone and a fair-trade latte made by a hipster with a bad hat than drive somewhere for the weekend with three other friends to go wine tasting. They're the type of people that have evolved beyond cars. I'll sum up what you've heard about the MKZ in four words: "It's a Ford Fusion." That is pretty much 100 percent accurate. The one I drove was basically a Fusion Titanium 2.0 AWD with a different body on it. The Fusion Titanium is a good car, so it stands to reason that the MKZ is also a good car. And in a lot of ways, it is a good car. But it does have some issues that you just can't ignore. If someone can find a similarity between the exteriors of the Fusion and the MKZ, then they probably think that Charlize Theron looks like Mugsy Bogues. For being on the same platform, Lincoln, I mean the Lincoln Motor Company, has done a wonderful job of differentiating the brands. The MKZ is a somewhat polarizing design, and one where I am decidedly on the "like" side of. The crazed magician face flows to a higher rear deck that gives it a fastback look. There's also that strip of LEDs across the back which I think make for a great design, rather delicate and elegant. It's a rather attractive car. I would have liked to see them go a bit further. Jason spoke to Solomon Song, the designer of the MKZ, and they discussed having a full lift back instead of just a trunk. I like that idea a lot. Make it an Audi A7 for half the price. Then you really have a distinguishing characteristic. Center consoles are boring. They all look the same. The MKZ has a floating center console with room for storage underneath. This is cool in a Volvo/minimalist sort of way. The seats are supportive and have integrated cooling vents (I saw other people say the seats were uncomfortable, but I did a few four hour stints and thought they were fine), which keep your buttocks and related areas nice and chill. The gauges are digital and will change depending on what you want to see. Now the bad. There's a lot of hard plastic, from the push button shift to the whole center console. My test car has the collision avoidance system, and the fitment around that piece of trim in the dash looks haphazard and cheap. But the real problem is that this is basically a Fusion inside. I don't see how this interior is worth a premium over the Fusion's already lovely layout and design. At all. Maybe that floating center console costs a lot of money, because the materials certainly can't be more expensive. 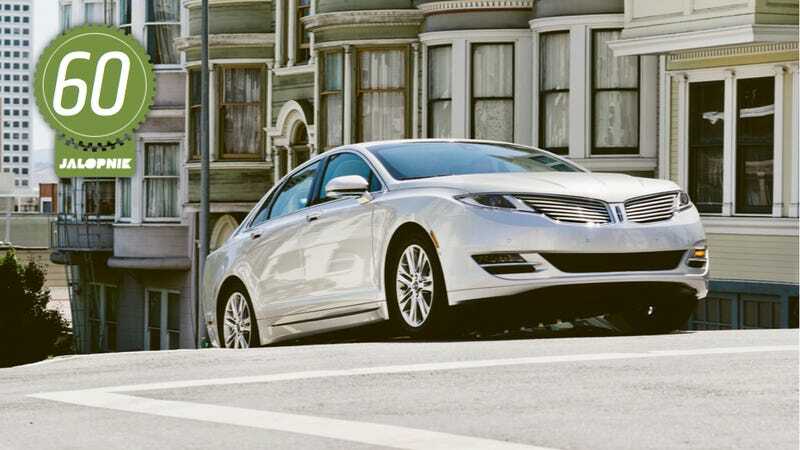 Lincoln differentiates the MKZ from the Fusion by offering a 3.7 liter V6 as one of the engines. Though I wanted to drive that one, I didn't get to. What I drove was the 2.0 liter EcoBoost, which is exactly the same as the engine in the Fusion. There is no difference. Curb weights for both cars are basically the same as well. That means, like we said in our review of the Fusion, this car is neither fast nor slow. It does feel pretty taxed under heavy acceleration, like how I felt when I had to run the mile in middle school (A mile is far!). An issue with the car I got to test is that it didn't have the two features that Lincoln touts — the panoramic roof or V6 — as big differentiators from the rest of the class and the Fusion. I'm sure the V6 is much more capable than the 2.0, but I can't tell you from experience. The pedal is soft and the brakes are grabby, it's not the greatest combination. A delicate touch goes a long way here. You have to be thoughtful about how you apply the brakes, or your building blueprints and thin rimmed glasses will slam right into the windshield. We don't want that, now do we? It's a comfortable car on the highway. It's smooth and relaxing, and at cruising speeds it eats up the miles like Raphael Orlove eats up dumplings. It does feel heavy, though. Over bumps there is a lot of mass is moving around, and I think that's because it feels quite softly sprung. I drove it back-to-back with a Lamborghini Gallardo and, while I enjoyed the Lamborghini, the Lincoln was definitely the more comfortable of the two. It doesn't really do handling. Steering feel is non-existent and body roll is rather prevalent. A competitor for the ATS this is not. It's more or less an art studio on wheels, and as far as I know there are no art studios lapping the Nürburgring. I understand it wasn't built for 'Ring lapping, but it doesn't feel planted. Same six speed auto as in the Fusion, same basic performance. I find it holds gears way too long in Sport mode and the algorithm takes too long to respond to a change in driving characteristics from hard acceleration to cruising. And then we come to the push button shift, something that is cool because Aston Martin has it and Aston Martin is for the cools. Well, in theory, yes, it is cool, but in practice, it has some bugs. A push of the button results in an audible thunk as the car goes into gear. It happened every single time I pushed the button after starting it. I was trying to think of another car where that happens, and I just couldn't. It made the MKZ just sound plain old cheap. Not really something you want in a new edition of American luxury. Stereo is solid and it makes my collection of Collective Soul albums sound like Ed Roland is in the car with me. Not bad. What is bad is the engine, which sounds anemic and overworked. There was also a considerable amount of wind noise at speed, which I thought kind of detracted from the idea of this being a quiet, comfy cruiser. I was super bored driving the car home in morning traffic the other day, so instead of playing Candy Crush and crashing into a tree I decided to try out some of the driver aids. The radar cruise worked just as well as any radar cruise system in any other car, which means that it doesn't crash into the car in front. Then there's the active lane assist. If you wander out of your lane, it'll actually turn the car and then give you a stern warning about keeping your hands on the wheel. Thing is, you don't really need your hands on the wheel. If the cameras can see the lines on the road, the MKZ will never wander too far out of them, and the radar cruise means you won't really be hitting things. It's truly one of the more incredible features I've seen recently. Oh, it also had Sync and MyLincolnTouch, which is MyFordTouch but, y'know, with a different name. I think Sync's voice recognition is wonderful, just make sure to enunciate. MyFordLincolnMotorCompanyTouch isn't my favorite thing in the world, but I'll deal. The MKZ 2.0 that I drove was $45,000. That's a lot of coin, and I'm not sure that it's worth it. Sure, it has the trick lane keep assist and it looks unique, but when you drive it, you don't get the feeling that you're driving a true luxury product. There's nothing here that made me think this was meticulously worked on to provide an appreciably different driving experience than the Fusion it's based on. If you can buy a car that looks just as good as the MKZ, is similarly equipped to the MKZ, and drives exactly the same, if not a little better than the MKZ for $10,000 less, why would you buy the MKZ? There just isn't enough differentiation to justify it. Just because the Fusion is a great car doesn't mean it can move upmarket and still be a great car. What is exceptional in a midsize sedan is not exceptional in midsize luxury. It's mediocre. Imagine if Cadillac decided to start rebuilding its brand by basing the first CTS on the Chevy Malibu? Cadillac probably wouldn't exist today. I tend to think that Lincoln's issue is that Ford doesn't have the depth that it used to have back in the Premier Automotive Group days. A new platform for Lincoln would be a huge investment for a limited return. If they still had Jaguar in the fold, they could codevelop a platform and then have two places to sell it. They could have architecture that would spawn multiple Lincolns and Jags. Remember the DEW98 platform and the Lincoln LS/Jaguar S-Type? That sort of thing could have happened again... and hopefully been better. But they don't have that now. Instead, Lincoln, I mean the Lincoln Motor Company, has to soldier on with rebadged Fords, hoping that a few special features here and there and some sales gimmicks can start to move Lincolns back onto the streets of America. The problem is that marketing, free dinners, panoramic roofs, and concierges can only do so much before people try the product. That's not how to save a brand. And when the customers realize it's a workhorse in an art-deco tuxedo, they won't be all that impressed. That's Lincoln's problem, and it isn't going to be fixed anytime soon.